We never want to compromise when it comes to creating a safe environment for students and faculty. Yet, with the vast number of choices available, many schools end up purchasing the wrong system for their needs. This article discusses some of the things to keep in mind and important questions to ask your provider when looking to install or upgrade your system. Security providers know that the lowest priced bid wins the job, so they have learned to bid low, and make it up in fees over time. A common misstep is not considering or estimating the total cost of ownership of the solution. 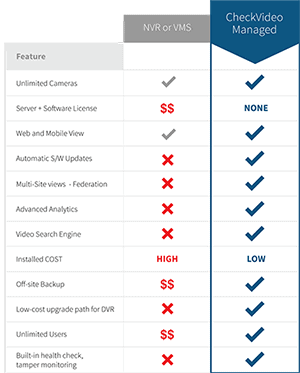 Pricing a surveillance system solely by adding the price of the equipment, cabling and installation could cost a fortune in indirect costs: IT costs to administer servers and recorders, ongoing maintenance and fixes, training, and subscription and license fees – especially when trying to add users or cameras. There have been many examples of schools wanting to add a new camera only to find out that the entire software stack had to be upgraded to a new version to accommodate a new camera and at a very considerable expense. It seems logical to ask a colleague for a recommendation when it comes to system purchases. While it is always a good idea to ask for recommendations or check referrals, it is rare to get a poor reference, and most users will not be very forthcoming about deficiencies or limitations of their systems. How can the impact of a security system be measured ? Is it sufficient for a video monitoring system to provide camera coverage where needed and record video for later review ? Shouldn’t there be more to evaluation criteria beyond image quality ? There have not been many quantitative measures that clearly demonstrate the benefit of a video security system. We discuss some measurable criteria based on actual use of the system and its impact on overall safety and security. Live Monitoring: It is common for multiple video cameras to be viewed live in a command center by one or more officers. How much would security be improved if these officers were out in the field ? Smart systems today can push relevant video to officers whether in the command center or in the field, alerting them to evolving situations, which can speed up response and prevent incidents. This has been shown to increase operator effectiveness by 50% or more, with a similar reduction in crime. Forensic Review: Many times a video monitoring system get utilized after the fact to investigate incidents. How many hours are spent every week, month and year on video investigations ? For large installations over multiple sites, these hours can add up very quickly. What if every investigation took a quarter or a tenth the time ? This is now possible with advanced search engines that find video in seconds. Complete investigations 75% – 90% faster, in seconds or minutes. Most buyers do not usually have the resources to dive deeply into solutions’ performance so they depend on a quick demonstration or on specification listed in vendor literature. There are many obvious pitfalls with this approach. Vendors are great at showing sample video clips captured under controlled conditions. Will this work in your environment and do you have the time or expertise to fine-tune every camera setting? How many vendors will demonstrate a real installed site, showing all aspects – live video, playback of recorded video during the day and night and searching for incidents such as people after hours ? We test drive a car before buying it, why not test drive your mission-critical security system ? A provider should be willing to provide a no-cost loaner that you can install in your environment and try for a month before making a decision to purchase. In fact, all users that may possibly use the system should get an opportunity to try it and provide feedback. After all, you will be living with this system for many years to come. Keep in mind that the evaluation and test drive should be easy, not require extensive training, and take no more than a few minutes of time. At CheckVideo, we believe in pricing transparency for the life of your system combined with demonstrated, measurable benefits. We always encourage customers to try our solutions before they commit to a purchase. Contact us for a free evaluation system – our system consultants will be glad to suggest the best solution for your needs and you are welcome to try it for a month, no strings attached!